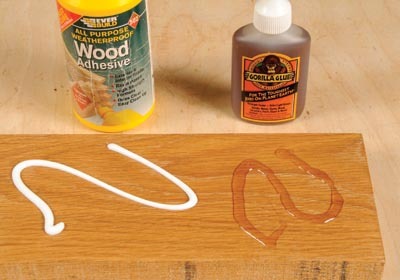 It is a valid technique to take two or even more thicknesses of man-made board and glue them together. It makes for a much stronger, chunkier construction and avoids the need to invest in a much more expensive and very heavy thick board, which is difficult to handle in full sheet size. Here is how to do this process successfully. 1. Lets assume you have cut the board to the correct size and square. 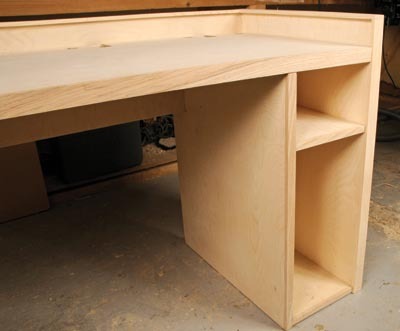 In the case of our computer desk project, the top consists of two equal size pieces while the end panels are two pieces of differing size. You need a means of aligning those critical edges and the method I use is the most logical, using several biscuit slots to get accurate alignment and to stop the boards slipping around on the glue when clamped. 2. Only a few glues are suitable. You can discount Cascamite powder types because they are too viscous and wonâ€™t easily spread out enough and you need the boards to close properly. Good old PVA is a firm favourite because it is runny and will spread properly. 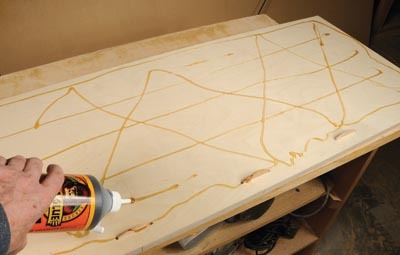 Aliphatic resin glue is likewise good but it has a fast grab so pile the pressure on quick. At the moment I'm having a lot of fun with PU (polyurethane glue). It has reasonable open time and spreads extremely well as it is an expansion adhesive. 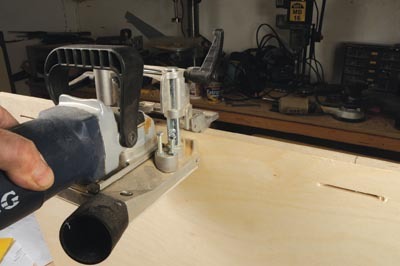 Just use plenty of clamps and weights to keep the joint tight. 3. I always apply a line of the glue near the edges so they are properly bonded, although with PU this line can be up to 50mm inboard as the foam will find its way to the edges as it expands. Then I create a loose diamond grid of glue lines and criss-cross with more glue where it appears lacking. You don't need glue over the entire surface as the panel will have plenty of integrity. 4. Panels are usually too wide for the throat depth of most clamps. 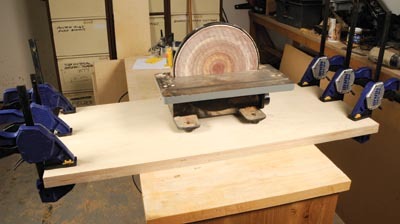 So clamp around the edges and use heavy weights in the centre to compress the boards together. Place them on a flat surface and pile up successive panels on top of each other so you can do them as a job lot.